State House announced Friday that President Koroma has nominated Dr. Abu Bakarr Fofanah as Sierra Leone’s next Health and Sanitation Minister, replacing Miatta Barlay Kargbo. Fofanah is expected to be confirmed. 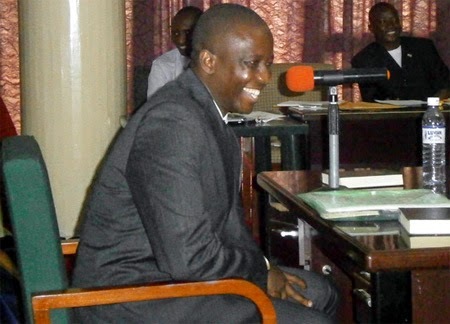 In this archive photo, Dr. Fofanah smiles during a parliamentary appointments committee session in January 2013. Fofanah was appointed deputy health minister. According to Awareness Times, he sailed through the appointments hearing.Fofanah trained at Sierra Leone’s College of Medicine and Allied Health Sciences and earned a string of degrees as well as experience in the United Kingdom and Sierra Leone, in which two countries he is qualified to practice medicine, the paper said. 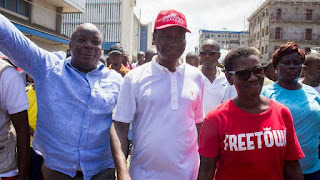 Fofanah also lectures at the College of Medicine and Allied Health Sciences and assured the committee members that he will still devote time to provide lectures to the country’s budding medical doctors. According to World Health Organization (WHO) statistics, Sierra Leone has two doctors for every 100,000 people. The College of Medicine and Allied Health Sciences was founded in April 1988 by the government of Sierra Leone with regional powerhouse Nigeria and the WHO. Abu Bakarr Fofanah earned a bachelor's degree in medicine from the College of Medicine and Allied Health Sciences, in 1993, and master's in physiology in 1995. He is licensed to practise medicine in the United Kingdom and Sierra Leone. Dr. Fofanah also holds an Advanced Diploma in Tropical Medicine from the London School of Hygiene and Tropical Medicine and a is member of the Royal College of Physicians in the United Kingdom. In addition, he holds an Advanced Diploma in Public Health and Tropical Medicine from the Institute of Tropical Medicine in Berlin, Germany; an Advanced Certificate in Vaccinology from the same institute, and earned a Joint European Masters in International Health, majoring in Communicable Disease Control and Prevention for developing countries.